Weather forecasts are made on maps. In the same way, Naturalliance will use maps for forecasting the riches of nature, on your land, in our communities and across Europe. Like weather-forecasting, it will need science and appropriate maps to forecast how the riches of nature will change as land and climate changes. 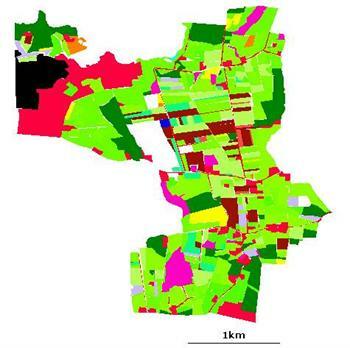 We intend you to use our forecasts to plan your land use to rebuild the riches of nature. Satellite maps support population models to forecast large species. Our Science Pages explain that some of the science is available now, but much remains to be done. The scientists will need support, both funding and data, to do that work. That is what Naturalliance aims to help you provide, by donation and mapping. Donation is important to help develop the science. Mapping is important because forecasting can only be done without cost if the maps are free. Many organisations are mapping species across Europe. We will link you to those who make this easy, and enjoyable, and make their data available for Naturalliance forecasts. Maps are widely available on computers. However, road maps and photographic images for navigation are not habitat maps. In order to forecast the riches of nature, we need maps of habitat or landcover. There is an excellent landcover map across Europe, managed by the European Environment Agency and free to use. We will help you use it for viewing areas down to the size of 250 m x 250 m.
Forecasting small species needs maps at farm (above), field and garden scale. However, to map habitats to 5 m, for individual trees, or to 1 m, for groups of plants and their insects, which feed all the larger animals, we need you to help build these free maps. If you register and donate, you can download our mapper and will be able to engage in personal and community mapping. The Naturalliance vision is that information from such projects will eventually map European habitats at fine enough scale to forecast the riches of nature everywhere. 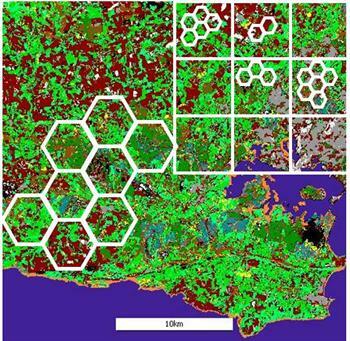 The Anatrack Mapper for TESS allows you to draw habitat shapes and position individual plants and animals on an image which you can align with the real world. The software is easy to use and runs on Microsoft Windows. Visit the links below for a variety of innovative sites or download the whole list - and please let us know what is missing. A project supported by European Commission to help identify invasive species and provide experts on them for more than 100 coastal and marine areas. An acoustic survey of bats in UK, Eastern Europe, Russia and Japan, using mobile phone apps and other technology. An initiative that stimulates projects across the UK on Soil, Air, Water, Biodiversity and Climate, with links to museums, academia and the National Biodiversity Network. Pictorial keys for identifying northern European birds, butterflies, fish and plants in English, French, German, Spanish and Scandinavian languages. Identification for birds, mammals and tracks, with quiz and tests of competence, in Bulgarian, English, Latvian,Macedonian, Norwegian and Polish.